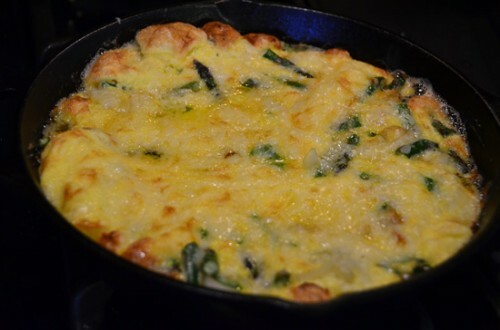 A new take on the classic frittata which warms both the kitchen and the cockles is the green chili frittata. Contrary to popular belief the frittata is no longer your mother’s go-to for a pot luck and over the years has taken on myraid variations. The reality is that these days it’s acceptable to make anything into a frittata which is fantastic because of the dish’s versatility. Is it breakfast? Is it lunch? Is it a late-night snack? The simple answer: Yes. Personally, I like to quench my sweet tooth with a nice banana frittata or if I’m feeling crazy the completely off the wall “Christmas Frittata” (even when it’s not XMas… hehe!!) but I recently tried something a bit more middle of the road and agreeable to everyone. The green chili frittata was great because it retains the familiarity of your standard frittata while adding a hefty kick. It’s like an old friend with a wild new haircut! And do I even need to mention the frittata’s staying power? It’s just as good after a quick nuke as it is straight from the oven. Preheat oven to 400 degrees. Lightly grease 9×13 inch baking dish. In a large bowl, mix the eggs, flour, baking powder and salt. Stir in the green chili peppers, cottage cheese, cheddar cheese and melted butter. Pour into prepared baking dish. Bake 15 minutes in preheated over. Reduce heat to 325 degrees and continue baking 35 to 40 minutes. Cool slightly and cut into small squares. Enjoy!